Here are a few of the relevant links to some of our Mayo Clinic sites, including our News Blog, Podcast Blog, YouTube channel, Facebook page, Twitter account and Sharing Mayo Clinic. Please feel free to follow me on Twitter, add me as a Facebook friend or subscribe to my Friendfeed if you’d like to stay in touch. More details about becoming a SMUGgle are available on the Enroll Now page. 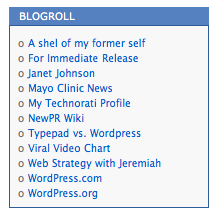 So politically oriented blogs tend to include like-minded others in their blogroll, for example. And blogs that are about social media often have blogroll links to others that have a similar focus. So I’m taking the opportunity of this course to both demonstrate blogroll management and to bring the SMUG blogroll up-to-date. Or actually, it’s what it looked like immediately after I did this first addition. Also, this course is the first one for which I’m using a YouTube screencast instead of a Slideshare.net narrated slidecast. I’ll post about how I did it in a future course. I obviously have some things to learn to improve the quality of the screencast (and make it a snappier presentation), but I think having the ability to show exactly how to do things instead of narrating still frames will be really helpful in the show-and-tell courses. Go to the sites linked above and subscribe to their feeds. See Social Media 102 on RSS feeds if you need a refresher. If you have a blog, create or update your blogroll. You get extra credit points for adding Social Media University, Global. iTunes, Podcast Alley and Yahoo are among the major directories that people use to search for podcasts that interest them. If you’ve created a podcast and want it to be widely heard, getting listed in these directories is important. So just how do you go about doing this? Glad you asked! Podcasting 110 takes you step-by-step through the process of getting your podcast listed, and reviews how you can guarantee that your podcast can be found through Google. Here’s where Chancellor Conversations is listed on Podcast Alley. If you really want to impress the Chancellor with your thirst for knowledge, subscribe to Chancellor Conversations. So, to become a subscriber, you can either click on that link in the sidebar, or this one, which has the same effect. Most of the segments so far have been “how to” lessons on podcasting from the 100-level courses. I look forward to further enhancing the production values and making Chancellor Conversations a little more polished over time. But this podcast is in keeping with SMUG’s mission, which is to help people explore how they can use social media, and to take the mystery out of it. As I try some new things to improve the quality, I’ll share those, but what you’re hearing in the first few episodes is what you can record for free using Audacity and a built-in computer microphone. And of course, the offer from Podcasting 105 stands, enabling you to start your own experimental podcast for FREE. We have a volunteer to be the class podcasting example. Toby Palmer has done the narration of his children’s book Lilly and the Russet Gigantus, and wants to make a podcast of the narration. So we will start by creating a category in the SMUG Podcast blog, which I have to do for him as an administrator. 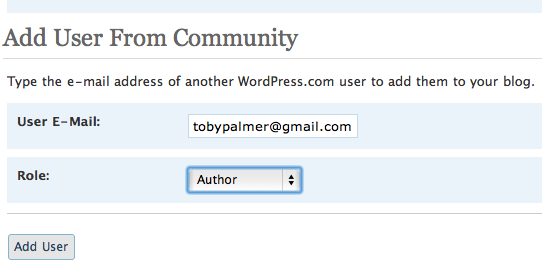 I can do this quickly and easily because Toby has used WordPress.com to host his blog.